Although the Greek which is spoken and written by Jews in various parts of the Balkan Peninsula differs scarcely at all from that employed by the non-Jewish inhabitants, the term "Judæo-Greek" is convenient as distinguishing this dialect from that spoken by Jews elsewhere. The same is true of the term "Judæo-Italian," which refers hereonly to the Venetian and Apulian dialects. The island of Corfu, being, so to speak, a bridge which joins the Balkan Peninsula with Italy, may be regarded also as the rallying-point of modern Greek and of the Venetian and Apulian dialects as spoken and written by Jews. The exclusive sway of the Greek language among the Corfiote Jews was of short duration, and lasted only as long as the first stratum of the community which had come from the so-called Romania remained homogeneous—until from the Angevin possessions of southern Italy other Jews slowly but steadily joined them of their own accord between the twelfth and fourteenth centuries. There were Greek-speaking Jewish communities in various other parts of the Balkan Peninsula (see Greece): in Constantinople, Salonica, Chalcis, Janina, Arta, Zante, and Crete, where Jews are still found, as well as in various places where at present none remain. For the Greek-speaking Jews of the Balkan Peninsula modern Greek translations of several parts of the Bible were made, e.g., that of the Pentateuch printed in Constantinople in the year 1547, and that of Job made thirty years later, which unfortunately is no longer extant. In Candia, a town on the island of Crete, a modern Greek translation of Jonah, manuscript copies of which are preserved in the Bodleian and the Bologna University libraries, was read as part of the afternoon service of the Day of Atonement. No record is extant, however, of a similar custom in Corfu, despite all statements to the contrary. These translations are strictly literal versions of the original, and, although in places very ingenious, show but little knowledge of Hebrew on the part of the translators. 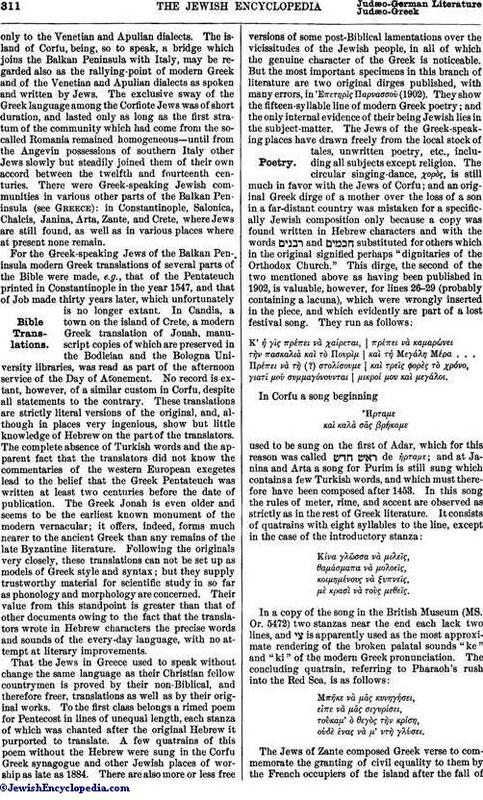 The complete absence of Turkish words and the apparent fact that the translators did not know the commentaries of the western European exegetes lead to the belief that the Greek Pentateuch was written at least two centuries before the date of publication. The Greek Jonah is even older and seems to be the earliest known monument of the modern vernacular; it offers, indeed, forms much nearer to the ancient Greek than any remains of the late Byzantine literature. Following the originals very closely, these translations can not be set up as models of Greek style and syntax; but they supply trustworthy material for scientific study in so far as phonology and morphology are concerned. Their value from this standpoint is greater than that of other documents owing to the fact that the translators wrote in Hebrew characters the precise words and sounds of the every-day language, with no attempt at literary improvements. τὴν πασκαλιὰ καὶ τὸ Πουρήμ | καὶ τἡ Μεγάλη Μέρα . . .
γιατί μοῦ συμμαγόνουνται | μικροί μου καί μεγάλοι. μὲ κρασὶ νὰ τοὺς μεθεῖς. οὐδὲ ἕνας νὰ μ' ντὴ γλύσει. The Jews of Zante composed Greek verse to commemorate the granting of civil equality to them by the French occupiers of the island after the fall ofVenice. In their speech they sometimes use words derived from the Hebrew ( , etc. ), but in a Greek form; whereas the same roots in Corfu are inflected according to the Venetian or the Apulian morphology. The better class of the Jewish community of Corfu speaks the Venetian dialect with some modifications, due to the influence of the Greek, which was the only means of oral communication among the first Jewish settlers of the island. The latter language, while gradually disappearing as a living one before the newcomer, bequeathed to it a certain amount of its vocabulary and some of its syntactic peculiarities. The constant solution of the infinitive ("che digo" = νὰ 'πῶ, "che ti vegna" = νὰ ῤθῇσ) is the most important phenomenon. The Venetian of the Corfiote Jews accordingly differs from the same dialect as spoken by non-Jews in the same town. A characteristic of this dialect is the formation in "ò" of the plural of nouns ending in "à," a formation which originated in the Hebrew ending , simplified, according to the Italian laws of phonology, into "ò," e.g., the Italianized plural of "berakah" is "berakhò" (for "berakot"); hence "novità," "novitò"; "cittò," "cittò." 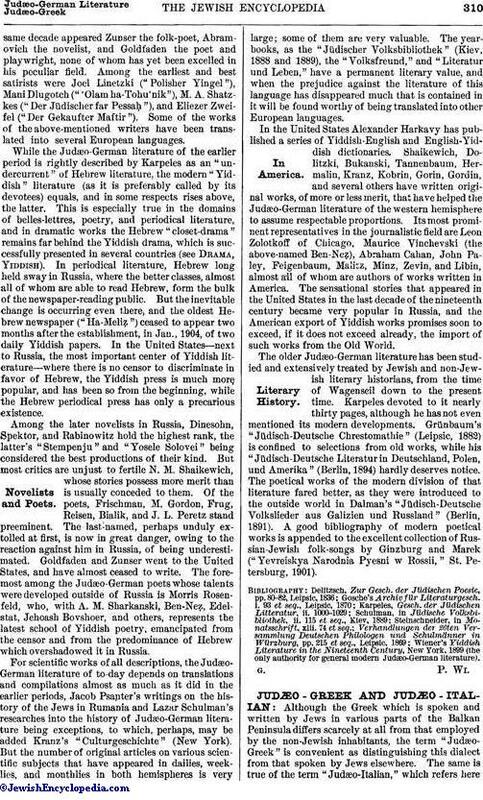 There has presumably been no Jewish literature in this dialect, since Venice herself very early adopted pure Italian as her official language, and all documents of the Corfu Jewish community were written in that language, which served too in Hebrew schools as the means of translating the Bible. The not very numerous Jews who went directly from Spain to Corfu did not long speak their own language, but soon adopted one or the other of the two predominant vernaculars of the place. In Arta is preserved the recollection of a Catalan as well as of a Sicilian and a Calabrian synagogue. All three were obviously built by Jews who went thither after a stay in Corfu which was so short that the very names of such congregations are unknown to the Jews of that town. There was also in the Albanian seaport of Valona (Arlona) a congregation called the , formed by refugees from Spain; but all these congregations must have removed very early from Albania and Epirus to Salonica, where they subsequently had maḥzorim printed according to their own rites.
" Pigiamu la cu li doi signali, e la spartimu a menzu, edizzimu: Comu spartimu chista , cussi spardiu lu Mari Ruviu, e passàra li padri nostri intra di issu e fizzi cun issi e . Cussì cu fazza cu nùi; chistu annu accà, l'annu che veni a la terra di omini liberi.—Menza mintimu sotto la tovaggia pir , e l'altva menza infra li doi, pir cu farrimu ." The Apulian dialect, in supplanting the Greek of the original settlers, took from it more material than did the Venetian. The borrowings extended to words expressing family connections: e.g., "patri," "matri," "fratri" (plural, "fraturi"), "soru," "figgiu," "niputi," "maritu," "muggeri," "carussu"; but γalγμαρὸ, νύφη, πεθερὸ, πεθερὰ, λεχῶνα, κουμπάρο-α, ἀνύπαντρο-η, and γάμu(= "wedding"; plural, γάμuri) (to express "they married," however, the Apulian "si spussàra" is used). Some vegetables and fruits are known only by their Greek names, both to the Venetian- and to the Apulian-speaking sections, e.g., σέσκλο, σέλινο, κοκκινογοῦμ, χεμονικὸ; and many of the terms used in the game of buckle-bones are Greek: κότσι, ἐνέση (?) μία, ἐνέση δύο, ένέση τρεῖς, ἕνας δύο τρέις, βούρδαλο, χάσουλο; but "panza," "buso," and "re," for which last the Epirote Jews say κερδουλός, while they call its opposite χασουλός. 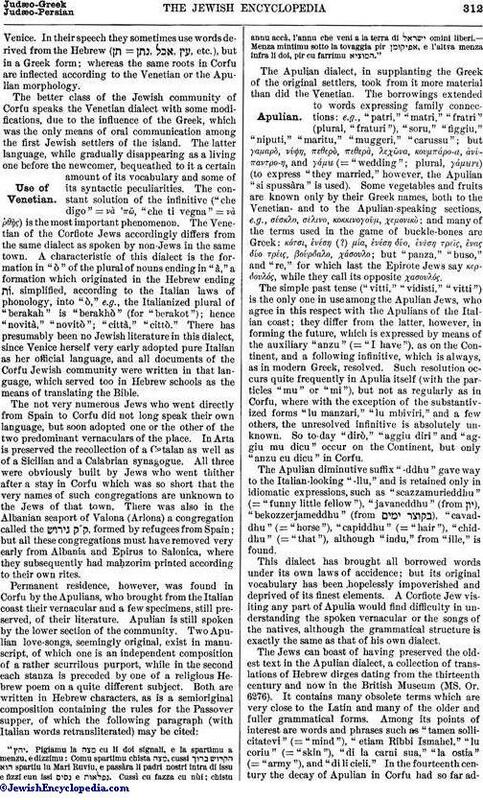 The simple past tense ("vitti," "vidisti," "vitti") is the only one in use among the Apulian Jews, who agree in this respect with the Apulians of the Italian coast; they differ from the latter, however, in forming the future, which is expressed by means of the auxiliary "anzu" (= "I have"), as on the Continent, and a following infinitive, which is always, as in modern Greek, resolved. Such resolution occurs quite frequently in Apulia itself (with the particles "mu" or "mi"), but not as regularly as in Corfu, where with the exception of the substantivized forms "lu manzari," "lu mbiviri," and a few others, the unresolved infinitive is absolutely unknown. So to-day "dirò," "aggiu diri" and "aggiu mu dicu" occur on the Continent, but only "anzu cu dicu," in Corfu. The Apulian diminutive suffix "-ddhu" gave way to the Italian-looking"-llu," and is retained only in idiomatic expressions, such as "scazzamurieddhu" (= "funny little fellow"), "javaneddhu" (from ), "bekozzerjameddhu" (from ), "cavaddhu" (="horse"), "capiddhu" (="hair"), "chiddhu" (="that"), although "indu," from "ille," is found. This dialect has brought all borrowed words under its own laws of accidence; but its original vocabulary has been hopelessly impoverished and deprived of its finest elements. A Corfiote Jew visiting any part of Apulia would find difficulty in understanding the spoken vernacular or the songs of the natives, although the grammatical structure is exactly the same as that of his own dialect. The Jews can boast of having preserved the oldest text in the Apulian dialect, a collection of translations of Hebrew dirges dating from the thirteenth century and now in the British Museum (MS. Or. 6276). It contains many obsolete terms which are very close to the Latin and many of the older and fuller grammatical forms. Among its points of interest are words and phrases such as "tamen sollicitatevi" (="mind"), "etiam Ribbi Ismahel," "lu coriu" (="skin"), "di la carni sua," "la ostia" (="army"), and "di li cieli." In the fourteenth century the decay of Apulian in Corfu had so far advancedthat readers were no longer able to pronounce correctly the words of this Hebrew manuscript or to grasp their meanings. Vowel-points were accordingly inserted, but very inaccurately; and later an incompetent scribe incorrectly substituted "duzzini" (= "dozens"), "douzelli" (= "young men"), "macchina" (= "machine") for "magina" (= "image"), and attempted to erase the superlative termination of "grandissima." It was perhaps owing to the influence of the Venetian that he spared all the simple futures; but in four or five places where the pronoun of the first person was erased the substituted words have so thoroughly obliterated the original readings that it is impossible to discover what was the old form of the peculiar "joni" which is now used side by side with "jò." Abraham: Abram, Abram-άκι, Bambi, Bamboli, Abramino, Nino. Solomon: Selomò, Σελωμάκι, Mάρκι, Salamon, Salomon. Sarah: Sarà, Sarina, Ωάρη, Ωάρω, Ωαρουλα, Ωαρινιὼ, Sandra. Rebekah: Rifgà, 'Pίκω, Richetta, Enrichetta. Simḥah: Mίχω, Mιχώνη, Mihhetta, Σιμιχουλα, Allegra, Allegrina, Eύθυμια. Στάμω (Stametta, Stamettina, Metti, Mattilde), Xάϊδω, Kόκω (from Byzantine Ωύδοκία), and Zαφείρω came from the Greek peninsula. 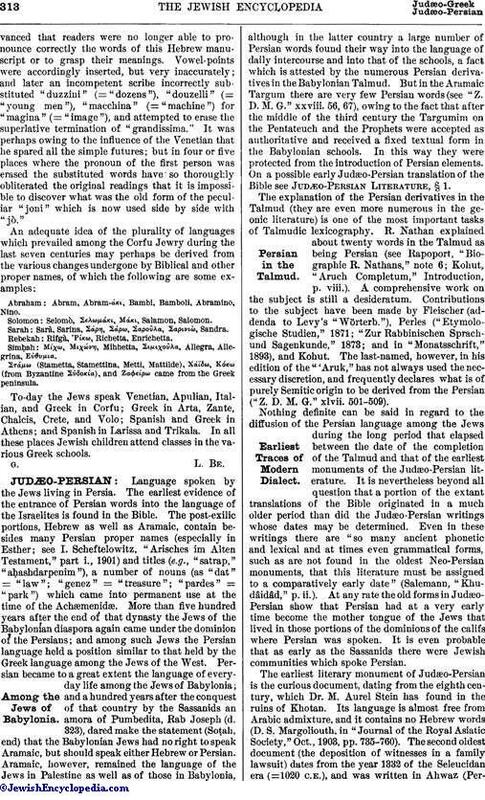 To-day the Jews speak Venetian, Apulian, Italian, and Greek in Corfu; Greek in Arta, Zante, Chalcis, Crete, and Volo; Spanish and Greek in Athens; and Spanish in Larissa and Trikala. In all these places Jewish children attend classes in the various Greek schools.